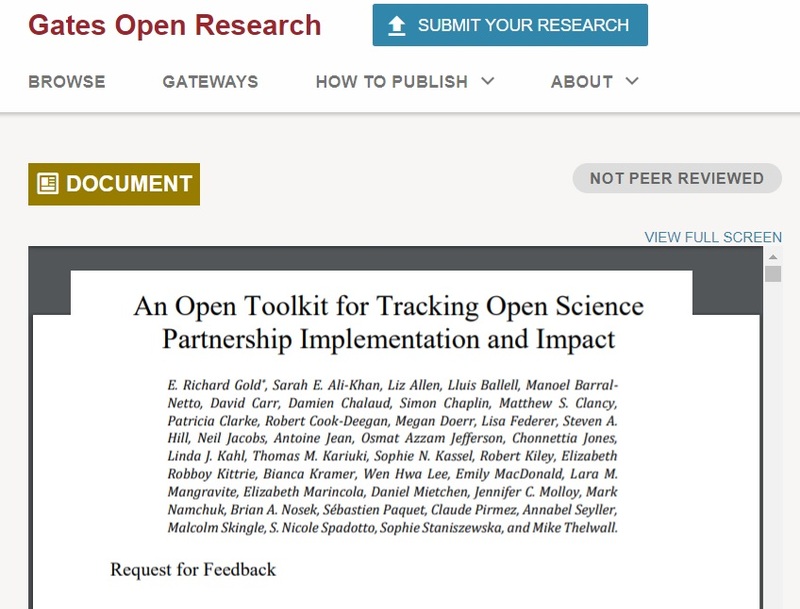 The report 'An Open Toolkit for Tracking OPEN SCIENCE Partnership Implementation and Impact' (published on the Gates Open Research) is now available for community feedback. All input/feedback is welcome till the end of January 2019. ... comprises a set of practices, including open education, open research funding, open access publications, open data and materials, preregistration, and the avoidance of restrictive intellectual property. Nevertheless, there exists no single standard for OS with the result that different organizations, governments, and firms apply OS as a label for their own favored set of practices. This article published on the Gates Open Platform (see also in .pdf) contributes to the OS discussion by proposing the creation of an open toolkit and data set, based on internationally developed and open measures, to provide an evidence base through which we can collectively determine if, how, when, and where partnerships based on OS principles and practices can contribute to social and economic welfare in general and research and innovation (R&I) in particular. Already, the Structural Genomics Consortium and the Montreal Neurological Institute (MNI) have agreed to use the toolkit to collect and share data. The present toolkit will need to be translated into open source tools that, to the extent possible, collect the data automatically. Any assistance in developing these tools would be most appreciated. Comments and suggestions on both the article and toolkit from the larger community are welcomed. Comments (relating to the comprehensiveness of proposed measures and what may be missing) from those studying, working with, or engaged in OS and OS-related projects are specifically sought. Comments on whether the breadth of the toolkit is too ambitious to be effectively implemented and, if so, what measures should be eliminated are also welcomed. Comments will be accepted online on GoogleDocs (*) until January 31st, 2019. After the comment period closes, the article and toolkit will be revised, taking into account proposed edits. The case for 'Open Science': Do we need intellectual property law? To keep up-to-date with AIMS news, please, Sign up for AIMS News, follow @AIMS_Community on Twitter.